Thrifty and Frugal Living: Ended- Wilton Cookie Master Plus Cordless Cookie Press Review and Giveaway! Ended- Wilton Cookie Master Plus Cordless Cookie Press Review and Giveaway! As you can tell, some cookies are a little bigger than others and have a slightly different shape. It all depends on how long you hold down the button. We were having so much fun that we got a little carried away and never changed out the metal disk to a different shape for the sugar cookies. : ) When the cookie press was out of dough, it was super easy to fill back up. You just hit the smaller "reverse" button and it pulls the plastic rod back into the barrel. Then, you unscrew the bottom, fill and put the bottom back on. So easy. I think it is a lot faster to use the cookie press (even with extra cleaning time) than it is to do cookies the "lazy way" that I normally do (placing spoonfuls on a pan). You can literally fill a cookie sheet in about a minute. Our second choice of cookies, the ginger cookies were a bad idea. In our defense, we have never made ginger cookies! The dough was REALLY hard and thick. We initially tried to use the cookie press, and it worked, but it felt like it was straining the cookie press. We decided after that to just roll the ginger dough into balls. Remember those recipe booklets I said come with the cookie press? Well, they have tons of different fabulous cookie recipes that we are going to use the next time we use our press. They also contain a recipe for twice baked potatoes that I will be trying soon! I kind of wish I had more recipes from Wilton. The only thing that I wish was different about this cookie press is that the metal disks were labeled. Some of the recipes "name" a certain disk, but you have to guess which one it is when taking it out of the box. Other than that, this is a fantastic machine and a great addition to our kitchen. Every kitchen should have one! Want to see our cookies before and after I attempted to icing them? Lol..Sad, I know! I am not very good with the icing thing. Plus, I don't own a piping bag. The sandwich bag was my accomplice in this case. Trust me, they tasted great! If you would like more information on the cookie press or would like to watch a professional video visit the Wilton page. 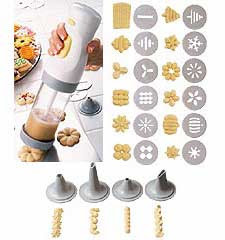 You can purchase the Wilton Cookie Master Pluse Cordless Cookie Press online through Wilton for $39.99. Or, you can try to win it now! Giveaway ends 5/24/10 at 9pm EST. Giveaway is for US residents only. No P.O. Boxes. Winner will be chosen randomly. Winner will be contacted via e-mail and then will have 48 hours to respond before a new winner will be chosen. Hello, This is a really cool kitchen tool. Would love to win this prize. I also would like to try the '3 Tier Pillar Cake Stand'. A FB Fan, FB name Barbara Lettelier Fitch. I love visiting your blog and learning of all the new things. So much fun. My want list for my kitchen is growing thanks to all you info. I would LOVE to win this cookie press! I'm always making cookies, cakes, cupcakes, etc. for church and school functions. I love the Wilton site and all their products... I have a good bit already. I really want and need 38 count large dessert/cupcake stand. Thsi would really come in handy. I follow Wilton on Twitter. I would love to try the Wilton 12 piece cake decorating set! I am trying to be more creative with cupcakes! I visited Wilton and would like the cake lifter. I always mangle the cake getting it out of the pan! I subscribed to your google reader feed. I really want to try the Giant Cupcake pan. What a fun cake that would make! I also would like to try the scale. That would make making frosting so much easier -- not having to measure out each cup of powdered sugar. I'm also a Wilton FB fan. i'm a new FF follower! I'd love to have a good cookie press! My mom and MIL both make spritz cookies, but I don't have a cookie press. Other than that, I'd like to try some of the mini shaped pans, like the Mini Fluted Mold Pan. I follow Wilton on Twitter (FC_Melissa). I like this...this is nice!!! I would like to try the 101 Dalmatians shaped cake pan. I would really like to get the Wilton Easy Flex™ Silicone Baking Cups. I'd love to have the Basic Metal Cutter set. I'd like to try the Dessert Decorator pro 415-850 $31.49. I'm sure it would help cookies and cakes look special. I'm a Wilton's facebook fan. I became a facebook fan of yours too. I became a subscriber of yours via email. I'm a email subscriber of yours. I'm a thrifty and frugal living subscriber via email. cdziuba@aol.com My daughter is pregnant, and I would love the Baby Buggy Cake pan to make a sweet cake for her shower. What I really want is a scale! I think I'd like decorating bags & tips, it would be fun to decorate cakes & cookies! I love cake pans, so I will pick the Dimensions Snowflake Pan. Thanks! my son loves cooking so we could really use this together. I want the Giant Cupcake Pan. I would like the bite-size brownie squares 24-cavity silicone mold. I would also like to try the Perfect Cut Brownie Cutter. This would make for nice slices for my family. I like the 9 x 2 3/4 Tri-Tanium Springform Pan. I've had the Checkerboard Cake Pan on my Mother's Day list for two years now; if I don't get it this year, I will have to break down and buy it for myself. I also love their Comfort Grip cookie cutters! The Angel Food Cake Pan would be great. I dont have one of those!!! 9 x 2 3/4 in. Tri-Tanium® Springform Pan would love to own this i dont have a springform pan. I'd love to try the Giant Cupcake pan! I own alot of their cake decorating items already & they're great! I would like to try the Bite-Size Brownie Squares 24-Cavity Silicone Mold. I'd like to try the Dessert Decorator Plus! Thanks for entering me into this giveaway what a great cookie press! I like the Bert & Ernie shaped Pan. Became a Wilton Facebook Fan (Elena Shkinder-Gugel). I’m your fan on Facebook (Elena Shkinder-Gugel). Follow Wilton on Twitter (@spelena). I would love the Silly Feet! Silicone Baking Cups-so cute! I follow Wilton on twitter as ptowngirl. I would also like the Dessert Accent Candy Mold. Thanks for the giveaway. I'd love to try the Cupcakes 'N More® 38 Count Large Dessert Stand! It would be great for parties! I follow Wilton on twitter as @ampaetka! I would like a Silicone bite size brownie mold. I visited Wilton and would love to try the 3-D Rubber Ducky Pan. How fun! Subscribe via RSS feed email. Wilton Fan on Facebook. My name Sarah U.
I fanned Wilton on Facebook. I fanned you on Facebook and left a comment.